The League of Extraordinary Bellydancers is a Raleigh, North Carolina-based bellydance troupe founded by Emily Beaman and comprised of her intrepid band of fellow performers. Their signature style combines the exotic art of bellydance with the geek fandoms you know and love. From outdoor festivals to bustling conventions; intimate venues to packed theatres - our performances can be adapted for any size stage and any size crowd. We've been honored to open for the experimental performance art band Beats Antique at a packed Haw River Ballroom; as well as share our signature Game of Thrones-themed set featured Dothraki sword dancers, dragons and the Khaleesi, with George R.R. Martin himself at ConCarolinas 2014. In April 2015, we held our first Geektastic! stage show, featuring geek-themed acts by local performers. It was a sold-out show, resulting in standing-room only. From sci-fi to fantasy, steampunk to anime, The League of Extraordinary Bellydancers brings you theatrical geek-themed bellydance at its finest. When you attend an LXBD show, expect to see Sith vs Jedi lightsaber battles, Hogwarts students tricking Snape into downing a dance battle potion, and a Mass Effect femShep showing off her biotic prowess. The talented ladies of LXBD are well-versed in multiple styles of bellydance. ATS? We got a power trio. Egyptian drum solos? Bring on the maqsoum, baby. Tribal fusion? Let's get pop and lockin'. 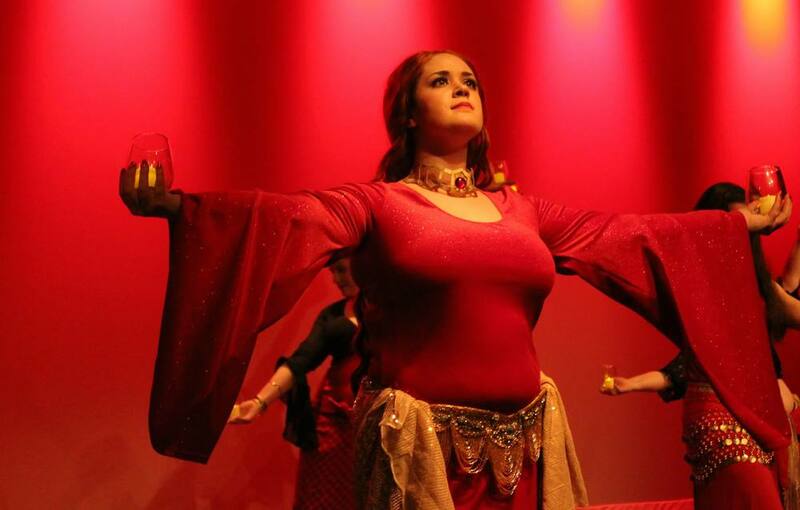 In addition to several years of professional bellydance experience, each of our troupe members brings their own unique talent to the group as well - from costuming, to burlesque, to live theatre experience. With all our powers combined, we form a versatile troupe capable of creating unique, fun choreographies that audiences go crazy for. Emily is a professional bellydance instructor and performer who has been dancing for over 15 years. 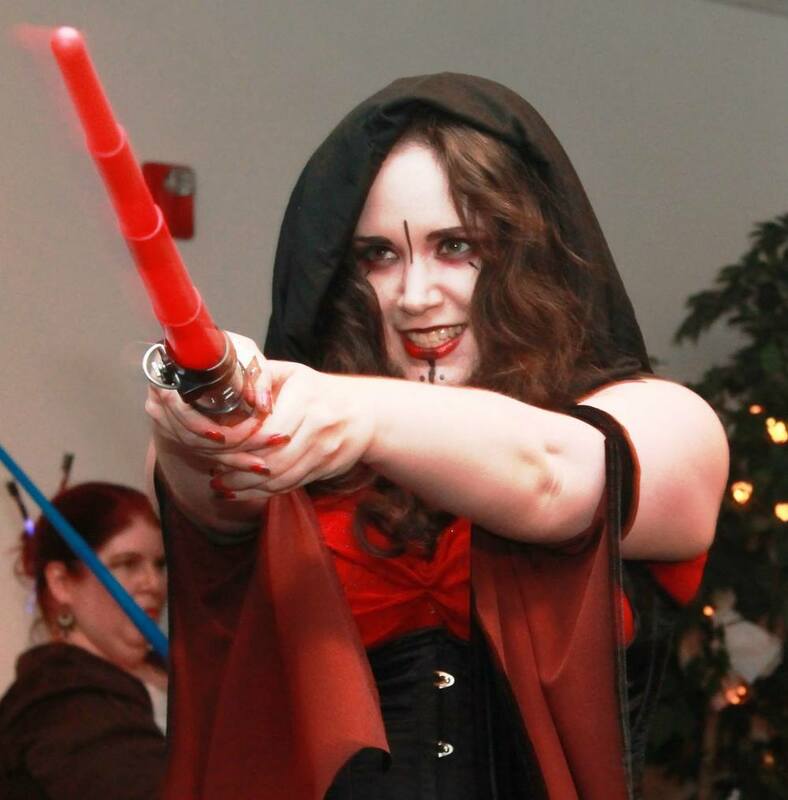 Combining her love of bellydance with her various geek interests is a dream come true! 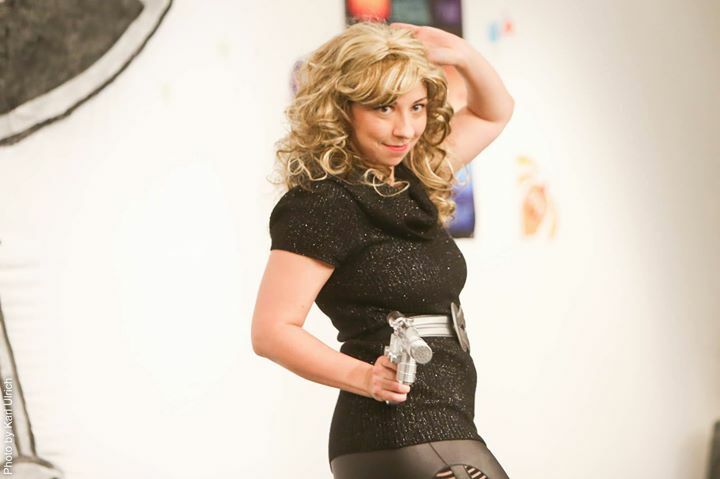 As director of The League of Extraordinary Bellydancers, Emily has the privilege of bringing her wildest geeky dance fantasies to life with a group of extremely talented and supportive dancers. Outside of dancing, she currently spends her time making geeky crafts, snuggling with her dog, and convincing herself not write more Dragon Age fanfiction. She also may or may not be secretly married to Batman. Deserae has been bellydancing since 2001. As a child she was raised on a steady diet of Star Trek, Star Wars, Dr. Who, and Bill Nye. She first combined her love of bellydance and geeky things when she began performing with Il Troubador Klingon Music Project as an Orion slave girl and Klingon dancer for the Chicago production of A Klingon Christmas Carol. 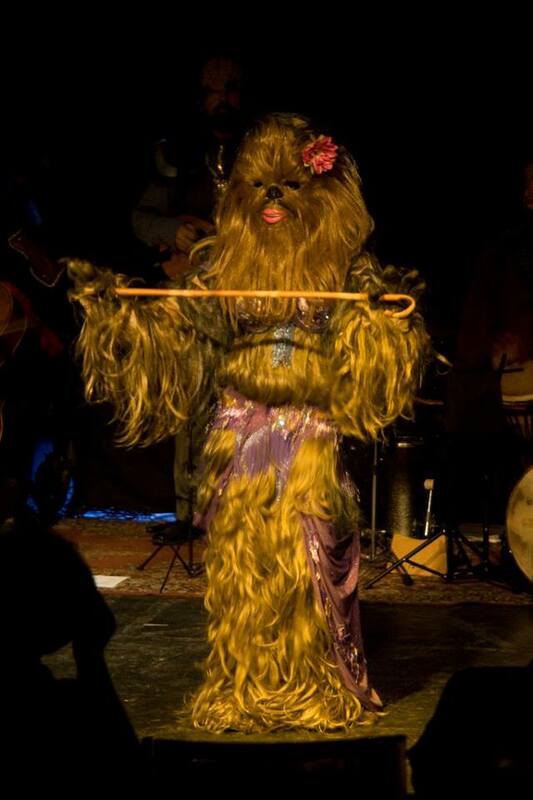 She later became briefly "internet famous" as Chewbecky the Wookiee Bellydancer. Geeky loves (other than dancing) include: Star Trek, StarWars, Dr. Who, Stranger Things, Sherlock, Game of Thrones (books too! ), LOTR, Harry Potter, Sailor Moon, Miazaki, Disney, Adventure Time, anything involving dinosaurs, Renaissance Fairs, History and science, Random facts, Sewing, reading as many books as possible (currently obsessed with 6 of Crows and Discworld), Medical stuff, Video Games (Especially Morrowind, Skyrim, Bioshock, Katamari, Fallout, Borderlands, Guild Wars, DDR, Bust a Groove, and Final Fantasy), Comic Books (X-men, JML’s Dawn series, Sandman, Danger Girl). Harleen has been in love with bellydance since she was in high school. She's taken lessons for the past 4 years and has been in love with geeky things like Star Wars, Harry Potter and the Lord of the Rings since she was 11 years old. She is very excited to combine her love for dance and all things geeky. Currently, she is into the Inheritance series books because she loves dragons. She loves cooking Indian cuisine and sharing her food with family and friends. In addition to this, she gets very excited to do crafty work and scary makeup for Halloween. Jennie has been a student of dance for most of her life. From ballet to band geek (I play flag! ), ballroom to bellydance there isn't a style in the 'Verse she won't try. Following her passion for globally connected improvisational dance, she was recently certified in American Tribal Style® General Skills and as an ATS® Teacher by Carolena Nericcio-Bohlman and Megha Gavin. A child of the 80's and devotee of The X-Files, she seeks truth and transparency; nurturing the hope that the United Federation of Planets will bring humanity to peaceful accord. Most of her youth & childhood was spent buried in stacks of fantasy serials. When not dancing, Jennie is raising a Princess of Power in the ways of the Force, haphazardly concocting costumes like a Weasley potion, reading tarot cards, or bullet journaling her way to domestic productivity. It is by caffeine alone she sets her mind in motion. Li took her first bellydance class in 2005 and has been dancing ever since! 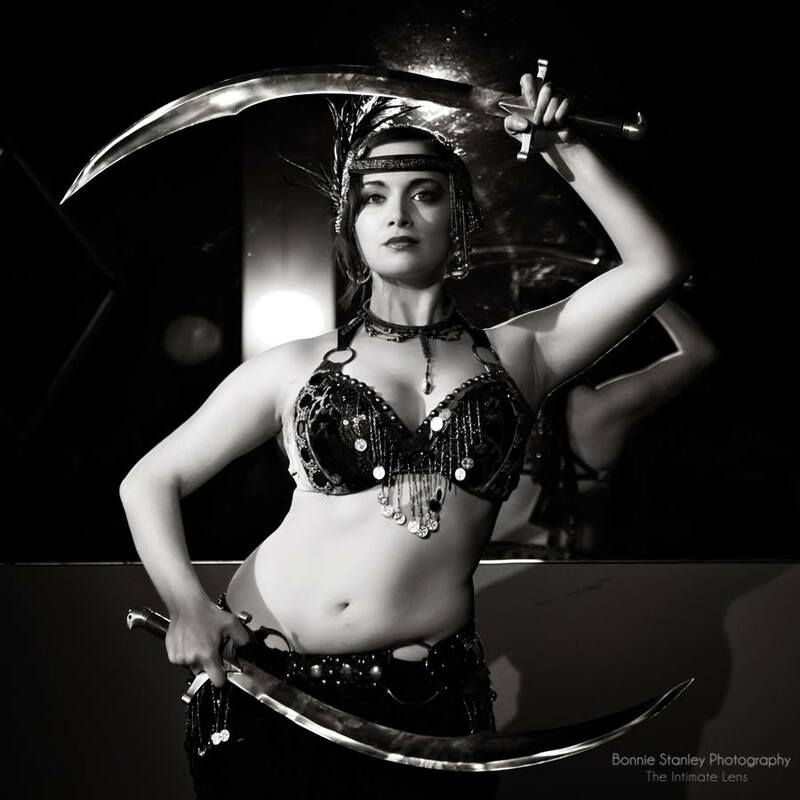 She has loved Egyptian, Cabaret, Tribal Fusion, and American Tribal Style over this time and relishes every new challenge and experience. The unique feeling present in a community of geeky fandom (and aiding in the discovery of new ones) means she is elated to share her lifelong geekery through dance expression as one of the League! Specific passions include (but in are no way limited to): Video game research, sociocultural anthropology, making jewelry, Journey (the game), Steven Universe, Mass Effect, Fallout, Mirror's Edge, Zelda, The Hobbit, The Unwritten, the BBC Narnia series, Doctor Who, Firefly, Shakespeare, Star Wars, Star Trek, Sherlock, and Ouran High School Host Club. Michalene is a lifelong dancer and has studied Oriental, tribal fusion, and ATS styles of belly dance for over 10 years. Her goal is to transcend everyday existence. She built a miniature fairy habitat at age 9 in hopes of eventual colonization. She is fascinated by the science of human life on Earth, the occult, the Regency Period, and has a tendency toward anthropomorphism. Michalene spends her free time creating handheld treats for gamers, crafting, swimming, walking the dog, and otherwise avoiding the classic domestic arts. Sara has a passion for contemporary bellydance in all its forms. She is widely known for her skill with sword and double sword. As a teacher, she particularly loves teaching creative expression, stagecraft, anatomy and alignment, and she is absolutely obsessive about safe dance technique. She believes bellydance is for everyone, young or old, fit or out of shape, heavy or thin, male, female or anywhere in between. Sara's interests include science fiction, fantasy, horror, vampires, dragons, vampire dragons, tabletop games, anime, graphic novels, nineteenth and twentieth century history, anatomy and physiology, environmentalism, the occult, green witchcraft, herbalism, music, social justice, gender and sexuality studies, and trying to dress like a goth kid from 1991. She writes novels, draws pictures, grows plants and raises a kid. Sonya was born dancing, but found bellydance in 1997 and hasn't looked back since, which reportedly once caused a collision with a stage curtain. Vintage American Cabaret, Tribal Fusion, Improvisational Tribal Style as well as countless workshops with touring instructors have melded into her unique style. In Texas, being an officer in the Austin Bellydance Association allowed her to bring new events to the community, and being a member of the Typsy Gypsys taught her how to dance outside in anything from 38-108 degrees (that's Texas weather for ya ...) and garnered a number of awards from the Annual Troupe Choreography Competition. Sonya distinctly recalls sitting in front of a TV, waiting for another Firefly episode that never came. She owns an autographed Issue 1 of Sandman (whole set - boarded and bagged, of course!) by Neil Gaiman, and reads any fantasy voraciously. Galaxy Quest, A Knight's Tale and Kung Fu Hustle are go-to movies to improve her mood, but Avatar still rules for eye-candy. Firaga is her favorite spell when playing Final Fantasy. Tess la Coil AKA “Glitter Legs” has been taking classes in one form of dance or another since kindergarten, but didn't find a form that she loved until she started taking belly dance classes with Andalee in 2007. Abandoning a wild career in zookeeping, she now works at a video game company and spends her nights writing bad fantasy and sci-fi stories. Tira began bellydance in her first year of graduate school in 2012 after seeing a video featuring our very own favorite potion's master dancing to Euprates Bled and Outer Sanctums. Mesmerized, she knew that she just had to give this bellydance thing a try! It's been full on geek out love ever since. With a background in cabaret bellydance and an internship in dance and drama therapy, Tira believes in the transformative power that movement has. Plus, she's a total geek. Her name comes from two of her many fandoms: Soul Calibur & The Dark Crystal. As a lifelong fan of playing dress-up and being overly excitable about far too many things, she is ecstatic to be a part of LXBD! Zaftig began studying bellydance with Haala in 2006. She has studied under Nandana, Sara (swords! ), Deidre (Veil) and Emily and enjoys the variety of experiences her teachers provide. When she was young, Zaftig saw Alice Cooper perform on the Muppet Show and she has never been the same since. Enjoying comic books, table-top role-playing games, car and board games, movies and television with equal relish, Zaftig has a great deal of weirdness to share.